Brightly adorned with the purple of blood. Saint Porphyrios lived during the reign of Emperor Aurelian (270-275), and was from the city of Ephesus. From a young age he was raised in the theater with the mimes, namely those who acted out every form and movement of people. Once he followed the count of Alexandria to Caesarea, and there he acted out the Holy Baptism of the Christians, where he was baptized by another mime who falsely pretended to be a Bishop. In this way they mocked the mysteries of the Christians. Now after he was baptized, he put on the white garment as is the custom of those who are baptized, and - O the miracle! - he accepted the Christianian faith and received grace from Christ. For when he was baptized, Angels appeared before him, who taught him to pray towards the east, and how to seal his forehead and entire body with the honorable Cross. Thus by this miracle, many came to believe in Christ, and they were baptized by a cloud, thus entering the catholic Church. 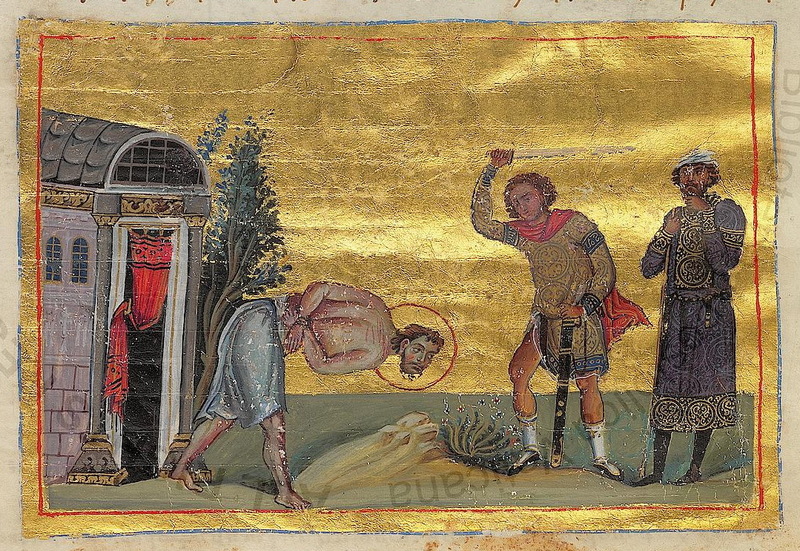 The count ordered Saint Porphyrios to deny his Christian faith, but he refused, and for this reason he was beheaded, and received the crown of martyrdom. 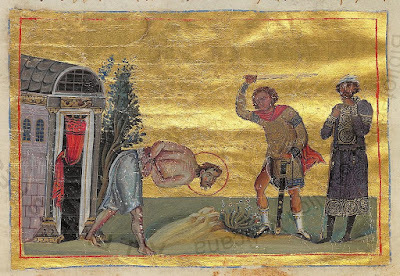 There are many mimes and actors who were martyred for Christ and are commemorated by the Church, and Saint Porphyrios is the first among them. All of them sought to mock the Christian faith, but divine grace proved that the Christian faith cannot be mocked. 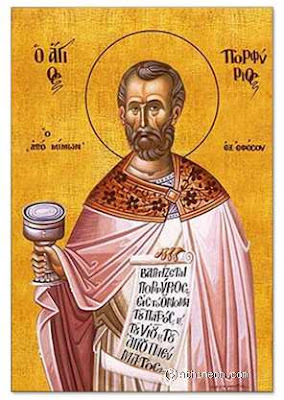 Among these other mimes is another Saint Prophyrios who is commemorated on September 15th, but he was martyred under Emperor Julian the Apostate in the late fourth century. Since 1992 Orthodox Christian actors and artists began celebrating Saint Porphyrios as their patron saint. An entire Divine Office was composed for him by Monk Gerasimos Mikragiannanites.